CastaSugar features are designed to speed up and not hinder your casting tasks - customisable and uncluttered for ease of use. We know you're busy - and we're here to help. All you need to do is provide material about the production for the applicants, questions and graphical assets, and we do the rest. We check and proof all materials, and provide advice and changes to ensure efficiency based on our extensive 15+ years of surveying/online casting experience. Once your casting site is set up and tested, we provide you access for a final sign-off to ensure everything is ready to proceed. On launch, we offer a free email blast to relevant members of our opt in database to help you get your casting call message out there. We can have a site launched within a day if your materials are ready to go. We provide a concise list of assets required to help you quickly organise your project, and once provided, store these for future use. Application periods range between 1 to 3 months* (where applicants can register and submit their applications). Once complete, the site goes into an admin-only state (applications are closed) for 1 month*, during which your casting process takes place. After the 4 month period the site is archived** for 6 months (or deleted on request). *These periods (application and administration) can be extended as required and a nominal fee charged per month based on the length of the extension. Applications may remain open for the entire 4 month period without additional fees. **CastaMicro sites will only be archived if requested (a nominal fee applies based on the archival timeframe). We like challenges and love customising our application. Let us know what additional needs you have and we'll provide a solution and quotation. These are undertaken on a needs basis and are quoted and scheduled separately to the licensing fee. Use our database of over 80,000 subscribed and segmented applicants to immediately connect to your audience. POA. The CastaSugar admin screen is clean and uncluttered - giving your casting team a simple and easy to use interface, and enabling new staff to get up to speed fast. Quickly search, sort, filter and view and print the applicant lists, watch their videos, add notes and change their status with a couple of clicks. And of course you can access the data anywhere - it lives on the interwebs. Keep your applicant contact and personal data safe - limit data exports to only those who absolutely need to use it. Casting Agent – provides full access without the ability to export data. Admin rights can be changed or revoked per user at any time by the Admin user. Integrate seamlessly with powerful external applications. If you need stats, we integrate with Google Analytics. If you want to use other standard software tools, such as Excel, you can export data to those tools. Have a limited budget? You can set applicant limits to automatically close registrations once a desired number of applications are received. Create custom tags and apply them in single or multiples to your applicants - create lists of tagged clients based on whatever criteria you need. All textual data received can be exported to CSV for importing into any external software (Excel, Mailchimp, SAAS, Filemaker, etc) for further interrogation or for archival purposes. This can be filtered on export (eg: only accepted applicants, etc) and limited to just the critical contact information, or a full dataset of all questions and answers can be exported. 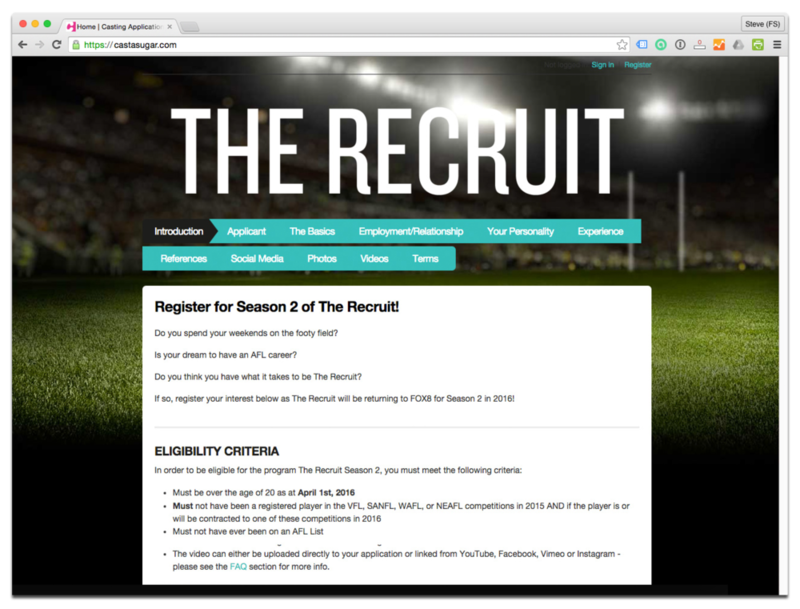 Get immediate access to applicants the moment they've registered, with profile images and social media links up front. Display and order applicants based on a range of criteria (status, gender, state, age, fast tracked, tags, etc) or by question responses. Advanced filtering allows you to choose criteria from within questions to further refine your applicant lists. You can also add your own workflow through custom statuses and filters. Casting administrators can choose which information to display within the casting deck. Select just the columns you need for speed, and hide the rest. Follow-up questions can be added to an application at any time. These are only visible to the casting team and are useful for 2 stage auditions, where an initial casting identifies candidates that can then be interviewed directly (over the phone/in person) and answers then recorded (by the casting team) on their application. All you need to do is provide the content (we supply a simple to follow check list to help you organise this) and we do the rest. If you wish to add more content anywhere in the site, or add/remove/edit questions before launch, you have the ability to make those changes using the content editing tools provided. No need to fuss about writing instructions, or common page content – we cover that and you can choose to update and edit it at your discretion. Choose between free text (to any character limit), multiple choice, multiple select and binary (Yes/No) questions. Questions can be made mandatory or optional. You can even have private questions that applicants won't see, but your casting team can use as part of your casting process. The site interface can be customised to match the colour scheme and branding of the production. Simply provide any assets and style guides for reference and we'll do the rest. More than 80% of applicants now use their mobile/device to apply to casting calls. All CastaSugar sites have responsive themes. All applicants follow a sequence to complete an application - only after they have agreed to the Terms/Privacy (and Collection Statement) are their responses available to the casting team. Of course we accept photos as standard in any application - all common image types can be uploaded (and can also be added by the casting team if required). You can also elect to turn them off if you don't need them. We accept video submissions in all digital formats - privately and securely hosted on Australia's most reliable video hosting infrastructure (Amazon Web Services). Once ingested they are transcoded as MP4 files for viewing and downloading. If you want to collect additional document , we accept all common document formats (PDF, DOC, TXT, Etc). Interacting with an online application can sometimes be bewildering for the uninitiated. Preparing images and video files can be a tricky business if you've never done it before. We understand this need and are ALWAYS happy to help. Our highly trained staff provides applicant support quickly and efficiently. No question goes unanswered and it is our principal mission to ensure all applicants are able to complete their submissions successfully through direct personal help, either by email or over the phone. We don't assume you've ever worked with our software before, but we are interested in standards and strive to incorporate these into our software on a regular basis. We provide personal guidance at any time during the application process at no additional cost. If you have a question or you need a feature, you can either find it in the video tutorials, or just shoot us an email/phone call and we'll walk you through it. Each site includes SSL encryption by default. Personal data recorded fully complies with the Privacy Act and is not reused for any purposes other than those stipulated by Castasugar and the licensee's Terms and Conditions and Collection policies (as accepted by applicants on submitting their data). CastaSugar addresses all security measures and updates with utmost priority. CastaSugar employs the gold standard of database and web hosting through Amazon Web Services - ALL data is hosted in Australia and monitored by the minute using Pingdom. CastaSugar license our customers to utilise CastaSugar on a per-use basis. This means CastaSugar retains ownership of all the underlying software code for the application.